Maine Veterans’ Home in Machias takes great pride in the many caretakers who provide care for our community. It’s even more significant for us to feature an employee who exemplifies everything our caretakers strive to be. Earlier this year, our very own Caitlin Atkinson was awarded the Cerner Nursing Assistant (CNA) of the Year Scholarship. Caitlin, who works as a nursing assistant in the memory care unit, received the scholarship at the American Association of Nurse Assessment Coordination (AANAC) Annual Conference in Las Vegas. Caitlin’s nomination was reviewed by a panel of judges from AANAC who reviewed more than 50 nominations for this year’s CNA award. The selection uses different metrics to help narrow down candidates. Metrics such as employment longevity, interaction with residents, family and staff, coaching or mentoring abilities, work ethic and quality of work. What stands out the most for Caitlin is her ability to recognize areas that can be improved and taking it upon herself to make that improvement possible. “One of the residents had sundowning, and I found that he liked watching movies on a tablet,” Caitlin says. “I went to the activities director and told her, and she purchased iPads for some of the residents to help them with their sundowning.” It was actions like these which led Marcia Jackson, the administrator of Maine Veterans’ Home in Machias, to nominate Caitlin for the award. Caitlin is currently attending the University of Maine at Machias and will be transferring to the University of Maine at Fort Kent in the fall. The $3,000 awarded in the scholarship will be put toward Caitlin’s tuition as she continues working through the nursing program. After completing her studies, she hopes to work at Maine Veterans’ Homes or with a community with similar values. After a few years of developing her professional career, Atkinson could see herself going back to a university. “I would like to work for a few years after completing the nursing program and go back and study how to be a psychiatric nurse practitioner or something similar to that field,” she says. A typical day for Caitlin at Maine Veterans’ Home in Machias starts with the afternoon shift where she begins working with team members to prep dinner for the residents later that evening. Once dinner is over, the residents attend various activities scheduled throughout the day within the Machias community. Activities like music groups, bingo and game night are only a handful of what’s available for residents. 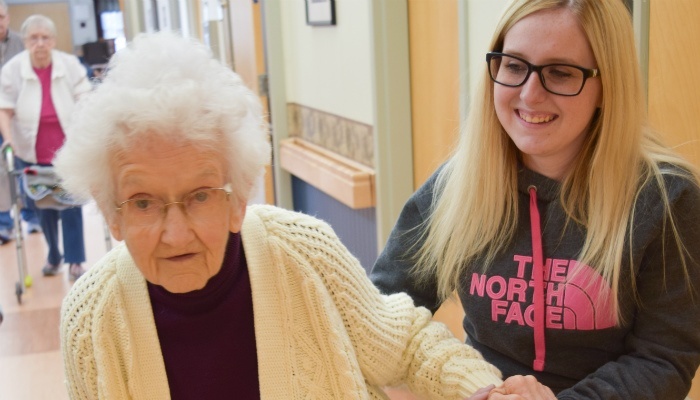 Caitlin’s favorite activity with residents is the exercise group. Caretakers at Maine Veterans’ Homes are instilled with core values which guarantee the best quality of care for our residents. These values are what drive Caitlin and other team members to be the best in their field. For Caitlin, respect and teamwork are keys for success.